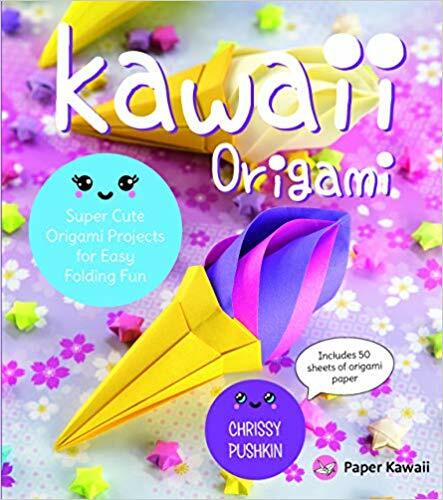 Kawaii Origami combines the cute Japanese pop art with more traditional paper folding to create original art using only colored paper and a few simple tools. If you or your crafty child love Japanese culture, this is a perfect choice for some fun-filled hours. The set includes fifty sheets of colored paper but I would highly recommend practicing on cheap copy paper first. All twenty-five projects include a difficulty rating of one to five stars. Even the pictures of the five-star Twinkle Star and Flower Bowl look complicated but the results are correspondingly impressive. Many of the easier projects, like the one-star Lucky Stars, two-star Tea Bag, and three-star Cute Purse are pretty enough to display or give as gifts. Spend a few hours being a maker and create some cute paper decorations using only Kawaii Origami and some scissors. Your choice of color will make each result uniquely your own. 4 stars for going beyond the usual frogs and birds of traditional origami books! Thanks to Race Point Publishing and NetGalley for a copy in exchange for my honest review.